Two sizes - Small/Medium and Large. This pattern came to my mind as I was putting away some laundry. We have a stack of washcloths, some bought and some made by my Mum, that we use on a daily basis. 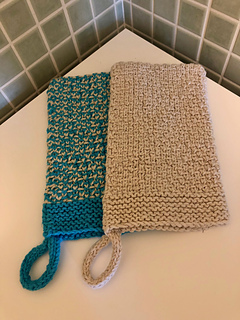 I thought that I would make some for gifts, but I didn’t feel too enthusiastic about knitting a square. Then I thought, does it have to be just a plain square ? I’ve been knitting lots of mittens lately and the idea of a mitten shaped washcloth jumped into my head. 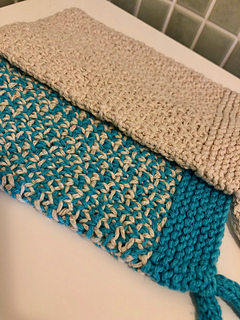 I wanted to have the option of using two colours, so I chose a stitch pattern that is fun to knit and looks fabulous in two colours. 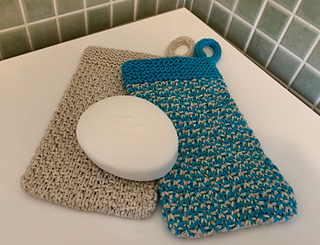 This is a quick, satisfying knit and would be perfect for Christmas or birthday gifts. The pattern has 2 sizes to accommodate all of your family and friends. You can make 2 solid coloured mitts in the size Small/Medium from one skein of the Sheepjes Linen Soft.